At the Kumon Group, we promote the assessment and reduction of the environmental burden resulting from our business activities, and promote forest preservation in accordance with our Environmental Policy. In FY2017, we continued efforts to reduce electricity usage and paper usage, and to increase paper recycling at each Group company. In addition, in order for anyone to be able to see the environmental data of the whole Kumon Group and of Group companies and offices anywhere at anytime, we implemented an environmental data management control system. Through the visualization of our environmental data, we promote efficient management and raise staff awareness of environmental issues. The year-over-year environmental data of the entire Kumon Group for the FY2017 shows that our electricity usage was 93.6%, paper usage was 92.3%, and paper recycling was 126.3%. ＊The reporting period is the FY2017 (April 1, 2017 – March 31, 2018), but the environmental data and activities also include data from outside this period. The Kumon Group promotes the reduction of electricity usage to contribute to reduction of greenhouse gases and to prevent global warming. We have promoted simple activities that we can implement in our everyday work, such as adjusting the temperature of air conditioning, turning off lights when areas are not in use, and putting PCs on power saving mode to save energy. As a result of each company’s active efforts, such as implementing LED lighting and renewing air-conditioning facilities, KSA’s electricity use was reduced by 20.8%: KEA by 11.6%, and Japan by 6.1%, compared to FY 2016 use. For the entire Kumon Group, we reduced the use by 6.4%. We will continue to promote our resource-saving activities. The majority of greenhouse gases emitted by the Kumon Group are generated by electricity usage. Therefore, we work on the reduction of our CO2 emissions by promoting the reduction of our electricity usage. Compared with the emissions in FY2016, the entire Kumon Group reduced them by 5.8%, and reduced intensity (CO2 emission/sales) by 8.4%. ＊The CO2 conversion coefficients used are the latest for each country as listed in “CO2 Emissions from Fuel Combustion” by the International Energy Agency (IEA). As the figures were disclosed only after our count, we retroactively corrected the data to the coefficients of the concerned fiscal year. As the Kumon Group uses a large amount of paper for worksheets, etc., we promote the reduction of paper usage to preserve forest resources. We have promoted the computerization of documents, paperless meetings, double-sided printing, and optimization of the layout of documents. Compared to the previous year, for paper use in FY2017, KSA and KEA made reductions by more than 20% and by 8.2%, respectively, in Japan. As for the whole Kumon Group, use was reduced by 7.7% and intensity (paper use/sales) by 10.3%. *We calculate paper purchase volume as paper usage volume. Each Kumon Group company promotes recycling, by placing paper recycling boxes to collect used copy papers as much as possible. In FY2017, KEA relocated its headquarters and reorganized its documents, which significantly increased the volume of paper recycling. As a result, compared with the previous year, volume increased by 26.3% for the whole Kumon Group. 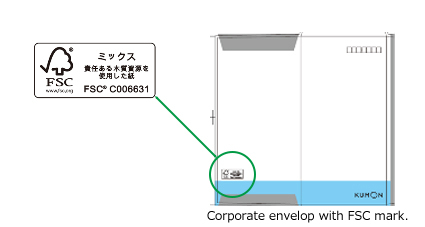 In addition, the Kumon Group implemented environmentally friendly FSC-certified paper for our corporate envelopes and business cards. The FSC standard is the world’s highest, most-used certification system. We will switch to FSC-certified products starting with those to replace spent stocks.